Dekotora are the decoration trucks. 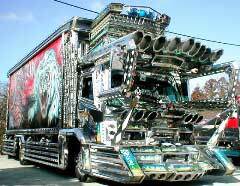 These are very flashy and loudly decorative trucks manufactured in Japan. The truck is very brightly painted with large neon lights. The exterior of the truck is made from shiny silver and golden steel. It is very flashy and loud colored truck. Some workers who loved to decorate their trucks created Dekotora concept. They were considered as art trucks. Today Dekotora is a fashion of customizing the trucks, which were manufactured in Japan. It is a passion of the truck owner. Whenever Dekotora would stop somewhere in public place it was a sight of attraction with its attractive colors and unique styling. It was really an Art truck. This was refreshment for the truck drivers who have to travel long distances. This would make them all fresh and ready for long journeys. This would turn their monotonous job into something attractive. The uniqueness of the Dekotora truck is that it is completely decorated or created by the driver itself. Drivers would change everything into more loud and bright. They will change mirrors, colors, interiors, everything. Even wheel caps will be a piece of art. Dekotora trucks are created out of good amount of money and lots of time given to them. This makes the ride more astounding and arty. There are many fan clubs, and rallies showing the unique work of art of Dekotora. We can even find the fan clubs and many different kinds of uniquely designed Dekotora trucks online. The decoration would include art from all types of field. There would be paintings inspired from classical theme to modern and even mythological era of Japanese culture. There we will find paintings from Anime cartoon, different gods, mountains, huge and elegant dragons, and beautiful geishas. There we will find trucks with soft edged paintings and some with very strong flare. Further, we will find roaring dragons, gangsters painting from Asian movies, and rock and roll heroes. The work of art is unlimited. The customization of the truck does not stop only to paintings. It goes far beyond that. The owners even changed the shape and size of the truck. Many trucks have huge winds and fancy edgings of the truck. More he mirrors and chromes are added along with bumpers, baffles, and boxes. On the front end, there would be huge grills, cab, and huge nose of the truck. They would change the entire look of the truck. They are more inclined towards art than practical purpose. Sometimes on the front end, the decoration of chrome is so huge that we question the visibility from the driving seat. They are huge and pompous. They appear huge and macho than their original size. They look as if they are robot in the form of trucks. The lights are also installed with a huge light effect. It lights with huge and bright light. They are multi colored very much flashing light breaking the darkness into day. 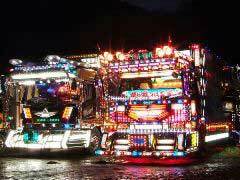 With muscular and loud decoration, large neon lights, these Dekotora trucks are the sight of attraction at nights. They give a feeling as if coming from some other planet. The truck decorators are not limited to just decorating from outside. The interiors are also as strikingly amazing as exteriors. Dekotora fans are passionate about their trucks. They give an entire make over to the trucks. We can even find the Victorian style drawings and interiors in the Dekotora struck. This gives soothing effect to the truck driver from long journeys. They can feel as if they have come to the place they like. Decorating such trucks is a very costly affair. It requires lots of time, money, and lots of dedication, which only true Dekotora lover can have.